We recommend checking out our discussion threads on the Genaray LED-2100 36 LED Compact On-Camera Light LED-2100, which address similar problems with connecting and setting up On Camera Lights Genaray. The user manual for the Genaray LED-2100 36 LED Compact On-Camera Light LED-2100 provides necessary instructions for the proper use of the product Professional Video - Lighting - On Camera Lights. The Genaray LED-2100 36 LED Compact On-Camera Light will light up 25' with a 65° wide beam angle at 5600K daylight color temperature. The light will serve you best indoors and outdoors at night. (Consider adjusting surrounding light sources, your camera's white balance settings, and other associated variables to balance well with the daylight color output.) A diffuser is built in to soften the light output, so that your subjects will be lit gently and with little contrast from area to area. 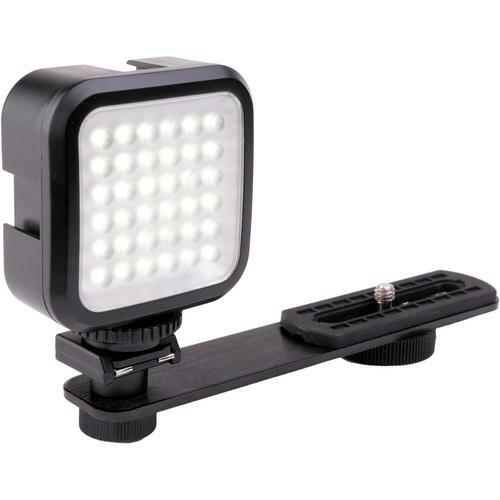 The light is stackable horizontally and vertically, so if you require more light, just connect additional units to the integrated shoe mounts on the top and sides, or snap them off for less light. The light runs on a lithium-ion battery, and two are included along with a universal wall charger. Each battery lasts an hour, so you can charge one while using the other. A cold shoe is integrated for mounting to a camera, and inside the shoe is a 1/4" thread for attaching onto stands and rigs. You also get an off-center bracket for attaching the light on the side of a camera, a thread adapter for mounting on Sony's proprietary AIS shoe mount, and a European plug adapter for the charger. If you own a Genaray on camera lights and have a user manual in electronic form, you can upload it to this website using the link on the right side of the screen. The user manual for the Genaray LED-2100 36 LED Compact On-Camera Light LED-2100 can be downloaded in .pdf format if it did not come with your new on camera lights, although the seller is required to supply one. It is also quite common that customers throw out the user manual with the box, or put the CD away somewhere and then can’t find it. That’s why we and other Genaray users keep a unique electronic library for Genaray on camera lightss, where you can use our link to download the user manual for the Genaray LED-2100 36 LED Compact On-Camera Light LED-2100. The user manual lists all of the functions of the Genaray LED-2100 36 LED Compact On-Camera Light LED-2100, all the basic and advanced features and tells you how to use the on camera lights. The manual also provides troubleshooting for common problems. Even greater detail is provided by the service manual, which is not typically shipped with the product, but which can often be downloaded from Genaray service. If you want to help expand our database, you can upload a link to this website to download a user manual or service manual, ideally in .pdf format. These pages are created by you – users of the Genaray LED-2100 36 LED Compact On-Camera Light LED-2100. User manuals are also available on the Genaray website under Professional Video - Lighting - On Camera Lights.